Just another quick post to say that I'm still awaiting laptop repair (and I've lost my internet connection at home for the time being. Great. ), so it may well be a little while before you see my face again. I get a bit of time to update my tumblr on lunch breaks, so follow me there for image related stuff and more personal updates. In the mean time, I'm super excited to see everyone who's coming on Saturday. The weather isn't looking all that great, but I'm sure we'll all have fun anyway. For anyone who hasn't seen, the final details are on a post just further down this page. Any last minute additions are more than welcome! The above was a quote I used when I was writing my MA dissertation. I’d highly recommend the series of zines it came from, which can be found at this etsy shop. I’ve spent a lot of time thinking about histories lately. This has come from further self-reflection, spending time thinking about my own body, and the parts of it I show and the parts of it I don’t. I’ve also become interested in fat bodies and marked bodies as corporeal histories, and how this is represented as threatening by society, because as people (particularly as women I guess) we’re supposed to be unmarked - we’re supposed to aspire to look clean and new, as if we’ve never fluctuated in size, taken part in physical activity, fallen over or, realistically, left the house! I’m a marked person - scarred (both accidentally and intentionally), with stretch marks, cellulite and varicose veins. I’m lumpy and bumpy, and I can’t claim to have a body of smooth feminine lines. To elaborate a little further with a case study: I have varicose veins around the back of my calfs, just below my knees. I wanted to photograph them for this post, but sadly my laptop is still fucked - in any case, they’re sizeable, bumpy and blue, and they’re noticeable whenever I wear a skirt. They’re something that I’ve known to run in my family, and something I despised when I was younger. I remember first noticing them about the time I was 14 - about the time I began inspecting my body in more detail. They were something I knew well from my relatives, so I knew they were there to stay. I was really ashamed of these marks. To me, I associated them with coming from a family who worked on their feet - which I know to make them protrude more and colour more. I grew up ashamed of my working class roots, largely because I came of age in a middle class suburb, around friends who never seemed to struggle or have to work or walk anywhere. Now, I’m proud of the estate I grew up on, but back then, my roots were something I tried to hide. I felt that the marks betrayed me, somehow, which I know sounds absurd, but they made me feel more different than I already was, and they connected me, physically, to a history I didn’t want to claim. I dressed for these veins - everything I owned had to cover them. No one ever mentioned them (in fact, only two people have ever brought them up with me, both recently), but because I noticed them, I couldn’t let anyone else see them. They made me feel vulnerable, and different, and I guess to an already insecure teenager with militant defense mechanisms, it made sense to cover them. Two things changed to make me stop doing this - firstly, I realised that I didn’t care about these marks on other people. Actually, in all truth I realised that I liked them - that I found them attractive in other people, and that as such I was applying double standards to the way I looked at my own body. The qualities that I perceived as weaknesses, imperfections and faults were unique differences on others. This is something I later learnt to apply when I thought about my fat - why was I letting it control how I viewed myself, when it made so little difference when I looked at others? Secondly, I guess I decided that I wasn’t going to let me enjoyment of anything (clothes, spaces etc) be hampered by a set of veins that I couldn’t even see! The back of my leg was not going to control my wardrobe preferences. Your body is a history - it’s a visual representation of where you came from, where you’ve been, how you’ve felt and who you have become. It’s one of a kind, and those differences are what make it unique. Don’t be ashamed of your experiences. Think of your stretch marks as tiger stripes, your varicose veins and scarring as a landscape. Next time you look at yourself in a mirror, or next time you talk about them, change your vocabulary. Speak about them as part of you, rather than as a dissociative, abject substance. Just as your past has shaped who you are, so has it shaped your body. Don’t be ashamed of this. Just a quick note to let you all know that I'll not be posting outfits for a little while! My laptop charger (I hope, it might be the laptop!) died this weekend, and I'm waiting for a replacement to arrive. This week I'll try to keep the more text-based posts up, but as I only have lunch breaks to do so until I can rely on my computer again, I'm not sure how successful I'll be. Another day, another horrifically exposed photograph! Oh dear. This was mainly to show off some over the knee socks I made by altering a pair of cable knit tights that didn't work for me (Dorothy Perkins, I'm looking at you right now! ), adding some elastic and some haphazard hemming. BIG BEACH BUMS - maps and plans! Another BBB post for anyone who's interested in attending (see here for the original post for any further information. It's a fat positive meet up, with vintage shopping and hang outs on Brighton beach. Anyone is welcome! Just let me know if you plan to attend by emailing me at fattyunbound@gmail.com). I've spent the last few weeks researching where to take us on our big day out (this has been a thinly veiled excuse to go vintage shopping a lot), and I've finally got a plan and a map! Hurrah! The interactive map with all points marked can be viewed here. I've put the itinerary information, along with a screen cap of the map with all of our shopping streets (I've put stars next to the shops I recommend), and some names of recommended eating places, in a PDF file, which can be seen downloaded here from megaupload for all attending. 11:00 - Meet in Pelham Square, which is a couple of minutes walk from Brighton rail station. It's a nice leaft square with benches, so we can all have a catch up while we wait for the others. 11:30 - We’ll all walk to Beyond Retro as a group to commence the shopping. Beyond Retro is the biggest vintage shop in Brighton - it’s not the cheapest, but it will be a nice large space for us to start rummaging. 12:15-ish: More shopping! Vintage shops in Brighton are pinpointed on the map to the on the following page. Depending on how many of us there are by this point, we can either walk around as a group or alternatively split off into smaller groups. 2:00: Reassemble in Pelham Square to compare finds, catch up with any late arrivals and have another chatter. 3:30: Beach time! We’ll meet in Jubilee Square this time, then wander down to the beach as a whole, where we can party rad fat style to our heart’s content! As people have trains and whatnot to catch, I’ve left the evening relatively free/unplanned, but for those who are staying late or overnight, maybe we could partake in a drink or two? I know of at least one 241 cocktail deal! If anyone is in Brighton overnight, I’d wholeheartedly recommend the Brighton Antiques Fair and Car Boot sale which takes place in Brighton Marina car park on Sundays from 7am-1pm. It is easily reached by buses from the train station (any that are going to the Marina), or alternatively you can get the Volks Electric Railway from Brighton pier (this runs every 15 minutes from 10:15) to Brighton Marina. I’ll certainly be going along, so if anyone fancies accompanying let me know! If anyone would let any further recommendations for things to do locally, let me know! My contact details are included on the PDF (phone, email, twitter), and I'm happy to answer any questions about the day or provide any information which is lacking. Anyone can join at any point of the day - just call or text me if you're arriving later into the day, and I can arrange for you to convene with the group. So, yes, spread the word, and I'll be seeing you all soon! Huzzah! 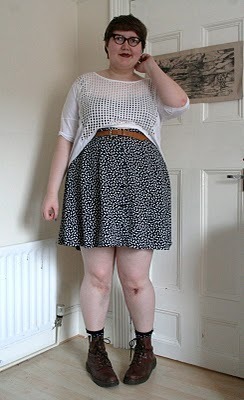 Another casual outfit for you today, with bonus fat girl in horizontal stripes points! Life is a bit hard at the minute - I'm dealing with a bully landlord, job applications and trying to finish all my craft projects too (the last one involved a jumper skirt, a quilt, a knitted cushion cover, a pleated skirt, a shirt for my boyfriend and some alterations - why did I start them all again?!) - so I've been mainly acting like a hermit in my room in particularly unglamourous outfits. Today, however, I'm pushing on and actually making progress! I've also just finished the itinerary for the Big Beach Bums meet up in Brighton, so once I can turn it into a PDF at work tomorrow, expect a slightly more exciting and upbeat post! One work outfit today. This grey pinafore (60s I believe) was a score from the last round of vintage stock I sold. Sad times! I found it when I was interviewing last year, and it's served me amazingly as a professional dress. This outfit *almost* makes me like dressing professionally, until I realise that there's really no need to do that when you spend your days hunting around in dusty vaults, as I do! I'm being filmed! Here's my outfit for today, spent working and then being filmed for aforementioned documentary. After my last post featuring my most recent remade skirt, I had some interest from others in a tutorial for the skirt. Whilst I didn't take enough details to make an in depth tutorial for the skirt, I thought I would nonetheless share those I had, and give a few tips about remaking items on a budget. It had a fitted waist (far too small for me! ), but a very very full skirt, and enough length for me to be able to construct another skirt after chopped the waistband off the original. This particularly skirt had a button up front and pockets, both of which I sewed up before starting. If you're just starting off remaking an item, I wouldn't recommend starting with a skirt with pockets or a pocket up front - instead just look for a long-ish skirt with a waist that can easily be removed, and a very full skirt (I find old granny skirts with gathered or pleated waists to be good for this, and they're always on a £1 rail!). I make my skirts using this tutorial, originally penned by DIY Couture (who publish an amazing series of books, without sized patterns - check them out!). Before I go on, please do have a look through this guide for a more detailed guide to planning the size of your pleats and waistband pieces. For reference, I tend to use either six or eight pleats on either side of my skirts. You then need to cut a portion off to use for your waistband at a later point. You can be approximate about this, but remember that you will need to fold the fabric for the waistband over twice (as per the DIY Couture book) and allow a seam allowance of about 3cm. Here was my waistband piece, and what would become the main body of my skirt. You will now need to cut the fabric for the main body in half - do this by unpicking the seams from the sides of the original skirt, or by cutting them out neatly, so you end up with two rectangles of (approximately!) the same size. Do the same with the waistband pieces, and then cut them down to two thin rectangles which both equal (in length) half your waist measurement plus about 3cm for seams. Width-wise, they will need to be double the measurement of your intended waistband width, again with a small seam allowance. Again, please refer to the DIY couture book for a slightly more articulate explanation of how to measure how wide and long your waistband. Sorry I don't have a picture of the waist band, but you'll need to set them aside for the moment anyway. Then, you'll need to sew, with a line of straight stitch, along the top of the skirt, fixing these pleats into place. Do this with both rectangles. With both waistbands pinned to the skirt body, now run another line of straight stitch along the length of the waistband - this will secure the waistband into place. Flip the waistband up at this point, and you will have the front and back of your skirt! Huzzah! With the right sides of both pieces facing towards each other (and the wrong sides facing outwards), tack together one of the sides of the skirt. You can run a line of straight stitch up this side, from top to bottom including the waistband to fix this into place. Pin the second side together in a similar fashion, but with a slight difference. If you want to fit a zip here, you will need to place your zip along by the waistband. Mark the point at which the zip ends, and pin the fabric together below this point (so you still have an unfinished seam for the space of the zip), and then as before, run another line of straight stitch up to this point. FITTING ZIPS. I'm quite rubbish at this (it's not hard, just fiddly, and it takes patience that I generally lack, haha), so I'm not even going to try and explain it. It is covered in the DIY Couture PDF, and there are also numerous youtube tutorials which can help. At this point, having fitted the zip, you will have you skirt *almost* finished. At this stage, try on the skirt, making sure that it fits okay and that you don't need to take the waistband in any further. Once you've confirmed this, you'll just need to hem the skirt - simply done by turning the raw edging of the skirt from right to wrong side, then pinning into place and running a simple line of straight stitch into place. I hope that all makes sense! Please do check the DIY couture booklet, as it explains things in a slightly less muddled fashion and should answer any questions you have. I just wanted to frame this within how to remake a skirt, which is so so much cheap than buying fabric from a shop, and also a skill which I find is super handy to know as a fatty working on a budget. This skirt cost me £2.30 (plus some thread, which I took from my stash) to make, including the original skirt and a zip, so it was very cost effective! This was worn for a Sunday morning spent car booting with my other half. I went to Brighton Antiques Market and Car Boot Sale and bought some amazing bits including a monstrous 70s maxi (£1), a green wool hat (50p), some records and a rather amazing gauze summer hat (£5, but I fell in love and my bargain hunting head was quieted. Perfect for Big Beach Bums!). I got very sunburnt, and sadly still feeling it, oh dear. I always make mistakes when dressing for a car boot, and today was no exception. The dress flapped about everywhere and I think half of Brighton saw my underwear! More than slightly frustrating, though I hope I've learnt my lesson and will stick to my trusty shorts in the future.